"Brahminism" in all its subtle attraction, because of its embodiment of ancient and truthful principles, was the subject which held an audience in closest attention last evening at the First Unitarian Church [Minneapolis], while Swami Vive Kananda expounded the Hindoo faith. It was an audience which included thoughtful women and men, for the lecturer had been invited by the "Peripatetics," and among the friends who shared the privilege with them were ministers of varied denominations, as well as students and scholars. Vive Kananda is a Brahmin priest, and he occupied the platform in his native garb, with caftan on head, orange colored coat confined at the waist with a red sash, and red nether garments. He presented his faith in all sincerity, speaking slowly and clearly, convincing his hearers by quietness of speech rather than by rapid action. His words were carefully weighed, and each carried its meaning direct. He offered the simplest truths of the Hindoo religion, and while he said nothing harsh about Christianity, he touched upon it in such a manner as to place the faith of Brahma before all. The all-pervading thought and leading principle of the Hindoo religion is the inherent divinity of the soul; the soul is perfect, and religion is the manifestation of divinity already existing in man. The present is merely a line of demarkation between the past and future, and of the two tendencies in man, if the good preponderates he will move to a higher sphere, if the evil has power, he degenerates. These two are continually at work within him; what elevates him is virtue, that which degenerates is evil. Kananda will speak at the First Unitarian Church tomorrow morning. 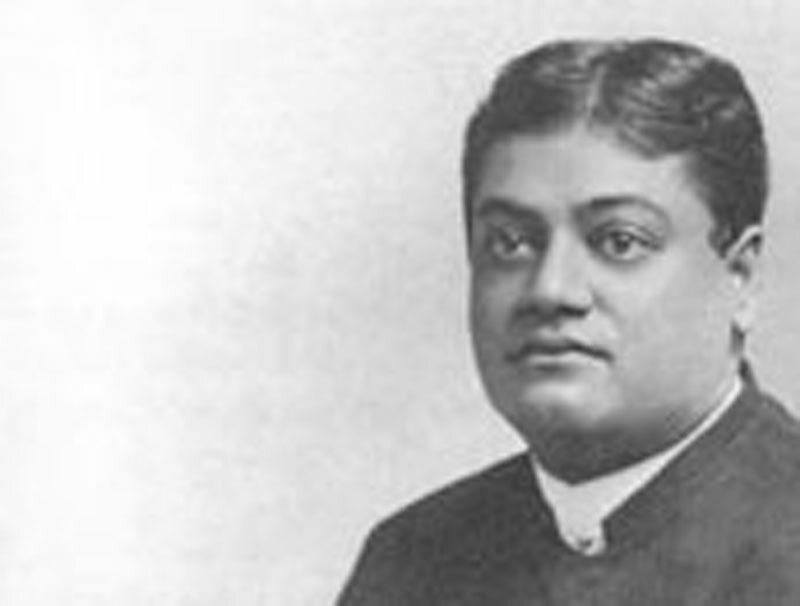 Swami Vivekananda, the talented scholar from the far-off India, spoke at the Central church last night [November 27]. He was a representative of his country and creed at the recent parliament of religions assembled in Chicago during the world's fair. Rev. H. O. Breeden introduced the speaker to the audience. He arose and after bowing to his audience, commenced his lecture, the subject of which was "Hindoo Religion". His lecture was not confined to any line of thought but consisted more of some of his own philosophical views relative to his religion and others. He holds that one must embrace all the religions to become the perfect Christian. What is not found in one religion is supplied by another. They are all right and necessary for the true Christian. When you send a missionary to our country he becomes a Hindoo Christian and I a Christian Hindoo. I have often been asked in this country if I am going to try to convert the people here. I take this for an insult. I do not believe in this idea of conversion. * To-day we have a sinful man; tomorrow according to your idea he is converted and by and by attains unto holiness. Whence comes this change? How do you explain it? The man has not a new soul for the soul must die. You say he is changed by God. God is perfect, all powerful and is purity itself. Then after this man is converted he is that same God minus the purity he gave that man to become holy. There is in our country two words which have an altogether different meaning than they do in this country. They are "religion" and "sect". We hold that religion embraces all religions. We tolerate everything but intoleration. Then there is that word "sect". Here it embraces those sweet people who wrap themselves up in their mantle of charity and say, "We are right; you are wrong." It reminds me of the story of the two frogs. A frog was born in a well and lived its whole life in that well. One day a frog from the sea fell in that well and they commenced to talk about the sea. The frog whose home was in the well asked the visitor how large the sea was, but was unable to get an intelligent answer. Then the at home frog jumped from one corner of the well to another and asked his visitor if the sea was that large. He said yes. The frog jumped again and said, "Is the sea that large?" and receiving an affirmative reply, he said to himself, "This frog must be a liar; I will put him out of my well." That is the way with these sects. They seek to eject and trample those who do not believe as they do.